The 116th Congress convened in January 3, 2019, but so far there is little indication that the government shutdown is over. If anything, spending bills are continuing to be approved piecemeal. With funding for a few months at a time, negotiations are critical. On December 22, 2018, the U.S. government shutdown officially began due to failure in passage of a continuing appropriations bill. Negotiations were underway between the House and the Senate when funding for the U.S.-Mexico border wall reached an impasse. In 2018 there was a 3-day shutdown in January, and an overnight shutdown on February 9, 2018, but there were important agreements reached on the budget by Republicans and Democrats. According to the Center on Budget and Policy Priorities (CBPP), while keeping massive tax cuts in place that largely benefit those at the top of the economic ladder, Trump’s annual budget aims for harsh deep cuts to America’s social safety net, such as to healthcare and basic assistance programs. Half of these cuts would likely come from programs that aid low- and moderate-income individuals and families. The budget would cut $4.6 trillion from mandatory (or entitlement) programs over the decade. These include $2.1 trillion in cuts to health programs, $923 billion in cuts to income security programs, and $231 billion in cuts to education and social service programs. Congress is focused on fiscal savings because the current deficit is almost $22 trillion dollars. The national debt has skyrocketed over the past 18 years. 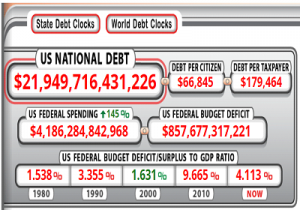 The U.S. Debt Clock contains a breakdown of debt versus revenue held. Annual federal spending is at the $4 trillion dollar range while the deficit increases by over $800 billion per year. The U.S. tax revenue only amounts to $3.3 trillion dollars, and each tax-payer appears to hold an average debt of $56,000 dollars. No wonder the Congressional Budget Office and conservative think-tanks are proposing ways to trim the government. According to USA Today, President Trump already has set his sights on 62 agencies and programs he wants to eliminate. The types of programs that conservatives like to defund include oversight for toxic waste dumping, food and occupational safety programs, permit review boards for oil drilling, management of national parks, and grants for minority businesses. A variety of aid programs both domestically and internationally are also on the chopping block, especially programs related to climate change, research, and clean technology. Trump also wants to cut down independent agencies, such as those helping to reduce homelessness or increase affordable housing. For the most part…operatives aligned with Heritage, the Federalist Society and the sprawling Koch brothers network have been on the inside making policy. By early 2017, Heritage produced a government reorganization plan that served as an initial template…They also drafted a list of 334 policy recommendations, about half of them aimed at domestic programs for poor people or Obama-era regulations protecting low-income consumers. The Heritage Foundation‘s report, “Tight Budget? Congress can Save $42 Billion by Eliminating Bad Government Programs,” outlines their strategic fiscal policy. Among its recommendations for elimination: legal assistance to the poor, federal police services, family planning grants, community service grants, job corps, job-training assistance programs, cultural and arts programs, educational programs, community block grants, public transportation subsidies, foreign aid programs, and clean energy programs. The Patient Protection and Affordable Care Act tops the “bad government program” list. Is the government shutdown anticipated and being used as a pretext for program defunding? Or is agency restructuring and program reorganization running against a wall due to the government shutdown? A one-sided look at how much money is saved by having government employees stay home for the day can be estimated based on salaries. If the estimated daily earnings of an average government worker is $208, then 800,000 employees furloughed will save approximately $166,666,667 or $167 million dollars per day. Thus a 10-day freeze saves $1.67 billion dollars in salaries, while a 20-day freeze saves $3.34 billion dollars in salaries. While this is miniscule compared to the 4 trillion dollar budget, one cannot help wondering if conservatives are willing to stoop to this level of nickel-and-diming the public. From the looks of it, the government shutdown is inline with President Trump’s philosophy for running a conservative democratic sovereignty. The President is not just stonewalling; the shutdown is time that can be leveraged against all opposition and ongoing investigation; it is inline with the conservative perspective that leaving open federal vacancies and continuing a trend in understaffing helps save taxpayers money. According to the White House 2019 Fact Sheet, “Modernizing Government,” the President expressed support for streamlining the federal government by eliminating duplication, establishing new partnerships, ensuring mission driven results, and incorporating management through information technology. In Executive Order 13781, the President also calls for eliminating unnecessary political positions, sharing IT services, and consolidating or realigning regional offices. While these ideas sound effective, it’s uncertain whether or not the President has the authority to force agencies to undergo restructuring, privatization, or closure. Federal News Radio states that “it’s unclear whether the president would have executive authority to split various offices and functions from a statutory agency—-or whether such moves would require congressional action.” However via cabinet appointments, agency reassignments, and strategic new hires, the assault on the commons has been steadily intensifying. Neither Congress nor Trump express many thoughts on the effect on workplace morale. There is an appearance of normalizing divisiveness and unfairness when segments of government employees are furloughed, while others are ordered to work without pay, and still others are allowed to report to work as usual. Trump and the conservatives may be getting their wish fulfilled whether Congress votes on the issues or not. 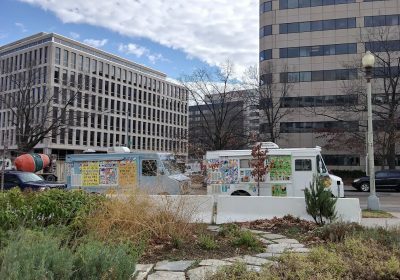 According to Federal News Radio, those who are hurt most by the shutdown tend to be the temporaries working for agencies such as the I.R.S., the Census Bureau, Park Service, or small private contractors such as janitorial services. What is uncertain is whether or not managers will use the shutdown to identify which offices can be permanently shuttered, contracted out, or used to plan future reductions-in-force. None of this would be shameful for Americans were it not that tens of billions of dollars in planned cuts to national domestic spending will effectively be transfered to military programs for pet-projects, such as unmanned combat drones (approximately $17 million each); missile defense systems (costing tens of billions of dollars per system); and at least 2,500 more F-35 stealth fighter planes (at $100 million each) with the program itself costing an estimated $400 billion dollars. You may have heard the U.S. government is shut down. Not a single war or base or ship has been shut down. Open up the non-military U.S. government! Shut down all the military bases! Instead, Trump’s An American Budget White House Fact Sheet calls for “Modernizing Government.” Whether or not this is double-speak as a way to promote subterfuge, “modernizing” includes a mandate to eliminate or modify approximately 400 agency plans and reports because they are “outdated or duplicative.” One can conjecture that just as venture capitalist Mitt Romney might have if he became President in 2012, the real intention is to parse and merge government agencies into a collective of outsourced, privatized, part-time jobs. Trump’s call for interagency sharing of information technology may be nothing if not an open invitation to subject career employees to strenuous surveillance by the security state with the intention of authorizing reductions-in-force or replacement by robots.